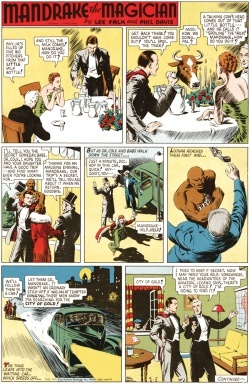 "City of Gold" is the 11th Mandrake Sunday story. The story was written by Lee Falk and drawn by Phil Davis. Mandrake and Lothar joins Dr. Cole and his daughter on their search for the legendary City of Gold. At the deepwoods.org index the title for this story is "City of Gold", which is lifted from the plot. Baden is a neighborhood of St. Louis and in Baden: Halls Ferry Road. This page was last edited on 26 March 2019, at 08:16.